Weddings, Weddings and more Weddings! I love Weddings. I am completely unashamed of my love of Weddings. I love the flowers; the decorations; everyone in a bouquet of different, beautiful dresses (and the guys looking very smart in their suits); and of course the stunning bride in her dress and her wonderful new husband. Summer is definitely wedding season and we’ve had two in two weeks (with another to follow in a couple of weeks time). I love celebrating with the couple their love and commitment to each other but as any wedding guest will know, a good wedding throws up the dilemma of what to wear. Should it be really smart? Should it be smart casual? What if it rains or is really hot? What will everyone else be wearing? Guys have it so easy! They can wear a suit and slip a tie into their pocket, to wear or not to wear, depending how they feel at the time. I’ve had a real challenge this year as a lot of the 80’s fashion (great as it is) doesn’t suit me – I’m completely the wrong shape. I also have a little boy who is six months old and so want something that isn’t too showy. I was inspired by a feature in Sew Hip magazine about re-fashioning and re-using (two things I am passionate about). They had a feature on how to turn a ‘granny’ dress into something more modern. I have to say, the challenge was too tempting for me and as you can see, this was the out come of my endeavours. I won’t tell you exactly how I did it because Sew Hip is so much better at explaining than I am (if you are interested it’s in issue 17) and my pattern is slightly different from theirs anyway. I used it more as platform to work off. Stupidly I didn’t take a picture of the dress before I started. 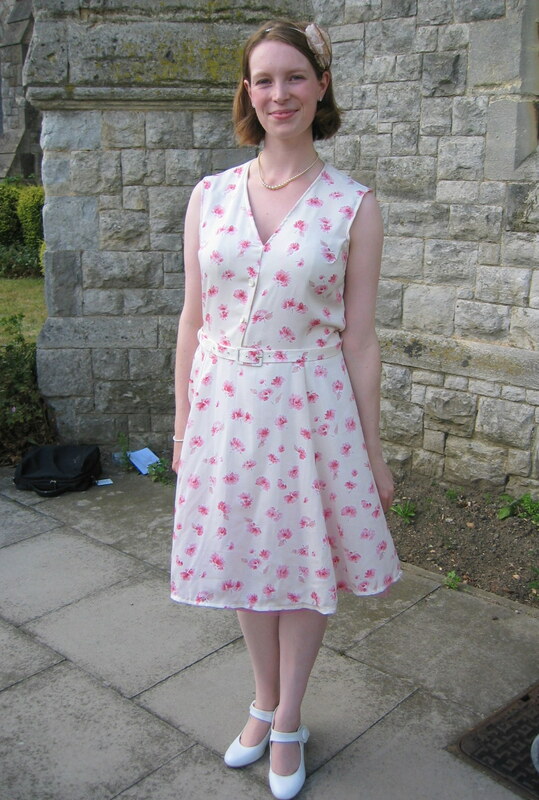 It was a size 18, ‘granny’ dress bought from my favourite local charity shop. It was in a kind of 1920’s style (drop waist and straight cut) with sleeves that went down to the elbow and a skirt that went down to the well below the knee. As you can see I took the waist in (a lot!) and brought the skirt up to just about the knee. I changed the skirt into an A line and put some pink netting underneath it to make it puff out ever so slightly and give is a better A line shape. I took the sleeves off; brought the neckline down a bit to make it more flattering and added the belt to make it look a little more 1950’s. I also used some left over lace to make a flower that I then attached to a hair band (which you can’t see that well in the picture but completes the look nicely). I love it and am going to wear it again, to the wedding I’m going to tomorrow!